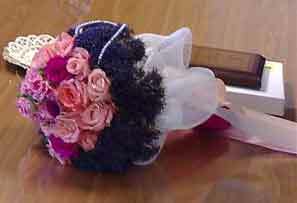 We offer a variety of wedding bouquets and Arrangements ! 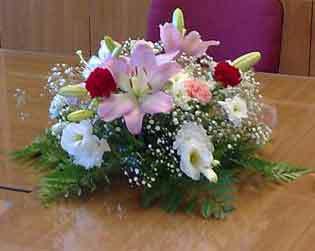 The flowers available in Cyprus no longer differ much from any other European country and are often imported. Of course local flowers vary with the seasons. The pictures at wedding flower arrangements were taken in response to requests to show some idea of the range of flowers we have supplied for weddings. This is an old page and is meant as a general guide only, as fashions change, so do we. But these are the kinds of wedding flower arrangements you can expect to receive from Cyprus flowers. We provide also specially ordered wedding bouquets, for your special day which will match the style and colour of the outfits you and your attendants will be wearing.. everything from corsages to special flower head pieces to brides bouquets and bridesmaids posies and petal baskets. See some wedding flower arrangements for your venue, be it town hall registry office, chapel or church. You may show us what you want in pictoral form or just describe the style and colour scheme. This was ordered as a town hall table decoration to be used later in the hotel room. Bridal posies can be made in any colour you like, they are usual around 65 euros but dependent on which flowers you choose. In the winter months we supply either a Papier Mache box filled with hand made French or Belgian chocolates or a cardboard box with even more chocolates. All year round we supply the standard Milk Tray selection box. Children's toys - we have a selection of teddy bears and novelties for children, from babies to the older young at heart.. The boxes to the right are for wine lovers. The first is perfect to present a bottle of wine or champagne as a gift. It contains all the toys a wine buff would play with, including a bottle opener. The smaller box is purely the toys in a cute padded box. Highly portable and an unusual and thoughtful gift. 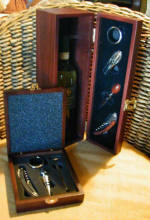 Wine and vintners sets - The hand carved hard wood presentation boxes show can be filled with whatever wine or champagne you choose and delivered for an extra cost - we also have plain wood presentation boxes with vintners tools in the lid and separate boxes of vintners tools to be delivered with your favourite wine or spirit. We will fill special requests such as diabetic goodies, children's toys or wedding gifts, just tell us what you want. Fill in the form ; Your wedding announcement in Cyprus here, free at wedding posts. Announcements being posted now for 2019 and 2020. Balloons, table decorations, gifts in a balloons, pinyata, table covers, huts, birthday signs, flags, candles, chairs, marquees etc. Contact Cyprus-wedding for all your cheezy wedding decoration requirements.